Once you’ve been on the Internet for a number of years, an unexpected bonus is that you begin to develop a plethora of passwords. The first few aren’t bad and you can usually remember them. After about a dozen, it can get pretty confusing. Some have to be eight or more alpha-numeric combinations, others can’t start with a number and some have to have at least one punctuation character included. What’s a person to do? You might want to consider RoboForm. RoboForm has been around for years, solving just this problem. With just a simple setup, you’ll no longer have to jot down passwords on sticky notes. This simple program remembers each one you assign, or better yet, it will create random complex passwords for you and maintain that list forever. In addition, RoboForm will fill in all those long “Setup-your-profile” pages everyone wants you to use. In setting up the application, you only need to tell RoboForm once what information you want shared (name, address, phone, email, etc.) Then, Robo Form Desktop 7 resides on your computer, waiting in the background. With one click you can then fill-in dozens of lines of information. Talk about a time saver. Want separate sets of information - like for home and for work? No problem, just set up separate "identities." Then merely choose which you want to use. Depending on the level of security you want or need, RoboForm will also remember your credit card information and fill that out when requested. 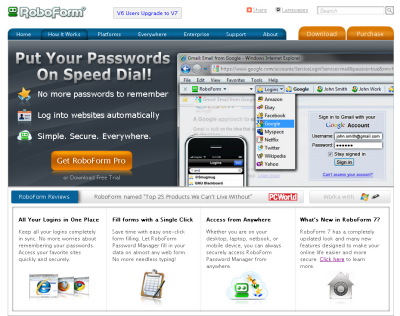 Obviously, if you load RoboForm with that kind of data, you’ll want to password protect RoboForm itself if anyone else has access to your laptop. RoboForm has just been updated to version 7 and it’s definitely worth a look. If you have a previous version of RoboForm, consider upgrading.